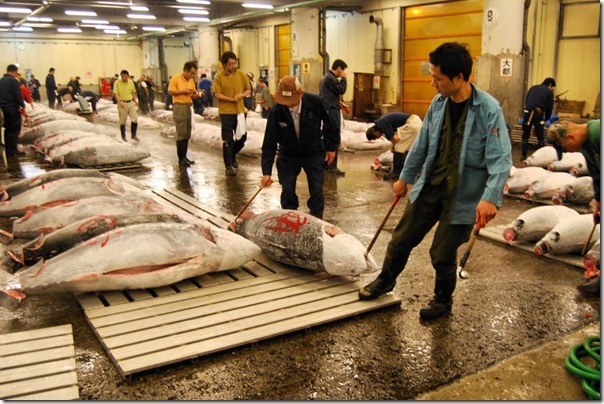 The tuna auctions begin at 5:20 AM each day, after which, the fresh products are distributed and shipped to the worlds best restaurants. Auctions are open to the public, but in limited capacity. Only 140 visitors are granted access each day done so on a first come basis. To catch the action, you will need to apply at the Osakana Fukyu Center at Kochidoki Gate starting at 5 AM. A first group of visitors is admitted to the auction between 5:25 and 5:50, with the second group between 5:50 and 6:15. If you aren’t awarded one of the coveted spots, not to worry, the market itself is quite the spectacle in itself. 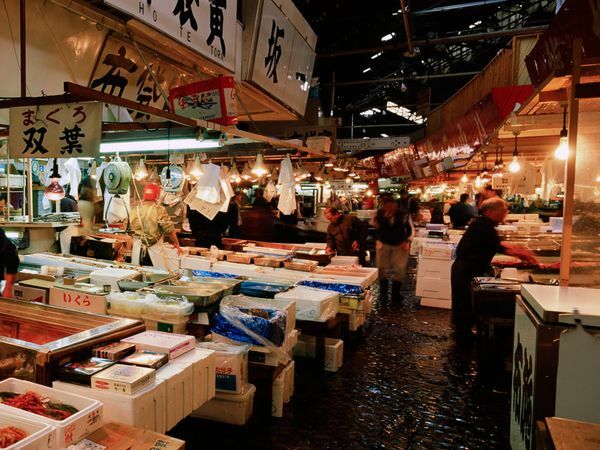 Numerous vendors hawk fish pulled from the seas that morning alongside other seafood treats. Scooters, trucks, sellers and buyers scurry around adding the to hectic vibe. Don’t have two hours to wait for some fish? Don’t want to wait two hours for some fish? No worries. The rows of narrow barracks surrounding the market house numerous and equally delicious sushi joints to hit the spot. Daiwa and Sushi-Bun are close by and also held in high regard. 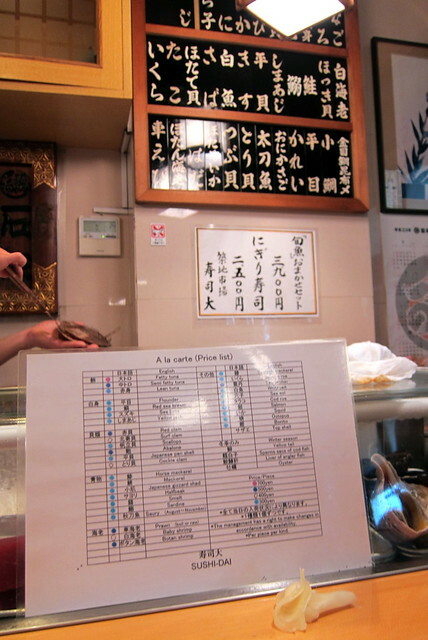 An omakase meal, usually 7 pieces of sushi and 1 roll with soup, at one of these establishments will run you around ¥4000 ($50 USD today) but is an experience only available in Tsukiji. Smaller portions are usually available for around ¥2900 ($38) for those on tight budgets who still want the sushi experience. 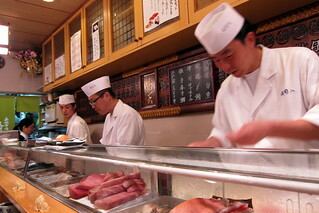 To catch the action at Tsukiji you”ll have to rally the troops and head out early. 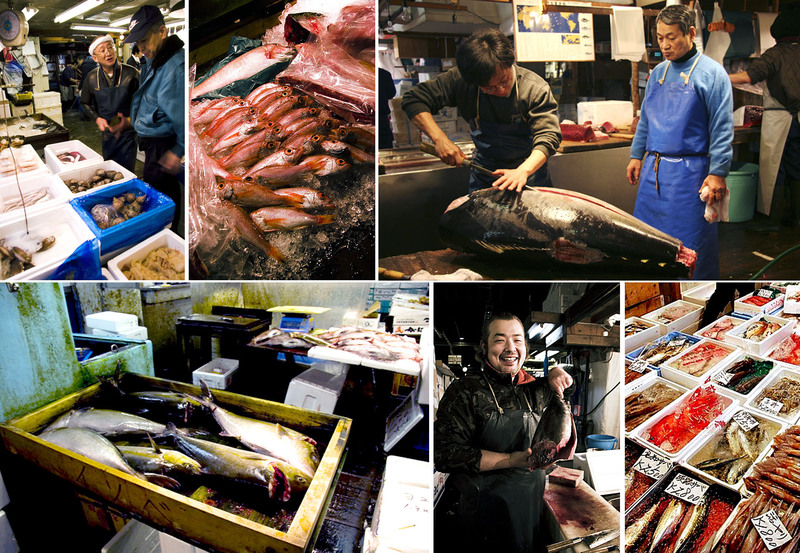 Tsukiji Market is a Japanese institution, a Tokyo sight not to be missed and a market unreplicated the world over. There is not a better way to start your day. what’s amazing is that after i complained, you took down most of the photos you “borrowed” from my flickr photstream without crediting. but you couldn’t take down all of them. Sorry I did not realize those were yours as well (the Sushi Dai ones are credited and linked back to your stream). They should be correctly credited now. Please let me know if there are any others of yours. And again, sorry. type of clever work and reporting! Keep up the superb works guys I’ve added you guys to my own blogroll.